Many people have asked me how I go about developing a post for Eat This Poem, and the answer is usually, it depends. Some poems are so clearly ready to be paired with a recipe that I think of one seconds after reading the last line. Other poems inspire me, but need to sit for a few days or weeks in the file drawers of my mind until I'm ready to visit them again. Sometimes it's the other way around, like today's offering, when I cook something that I love so much I immediately long for a poem to go alongside it. In true food blogger fashion, I posted a picture of these crepes on Instagram minutes after finishing breakfast with the caption "I need a poem to go with these crepes." Two readers answered the call with splendid little poems that made me smile. The first is a haiku from @thesugarhit. You can visit her blog by the same name. Second, a little rhyming poem from @katenolan2, who blogs at Pig Pie Pint. I love that both of these poems are short and sprightly. The use of "splodge" in the haiku works well because it's not as refined as a dollop might be, and anyone who has seen a plate smeared with blueberry sauce knows it's a completely delicious mess, as are our relationships on occasion. Although I normally shy away from rhyming poetry, Kate's stanza is whimsical, and a fitting response on Instagram, I think. Rather than say "Wish I had some of those crepes right now!" a few poetic lines make the response far more elegant. Thanks to you both for responding in verse! I've been incorporating spelt flour into my baking with relative frequency lately. It's one of the easier whole grain flours to swap for all-purpose white flour, and I've experimented already with pizza dough and pancakes with great success. 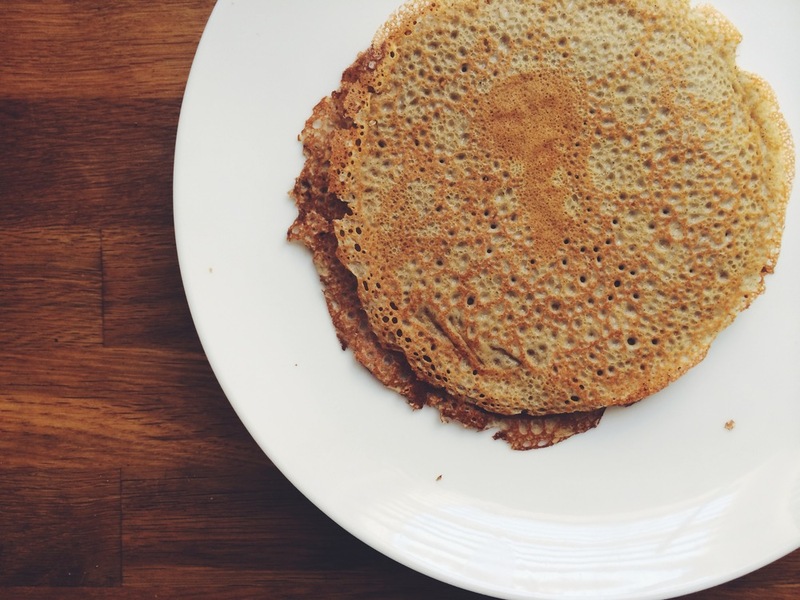 Crepes were a logical extension, and a ratio of half and half makes this recipe more wholesome to begin your mornings. The recipe is easily doubled to make more, but I found this to be enough for two people to enjoy on a lazy Saturday morning. Add all the crepe ingredients to a sturdy blender and process until very smooth. Add a small piece of butter to an 8-inch saute pan and warm over medium heat. Once the butter has melted, pour just about 1/4 cup batter into the pan (a little less than 1/4 cup is fine), and quickly tilt it in a circular motion until the batter spreads evenly. Cook until the edges begin to curl up and pull away from the bottom of the pan, about 2 minutes, then flip and cook the other side for just a minute longer. zest the lemon into the bowl with ricotta, and add 1/2 the lemon juice. Stir well to combine. Add the blueberries, maple syrup, and juice of 1/2 the lemon to a small saucepan. Bring to a boil, then simmer for about 5 minutes, or until the berries have warmed through and the sauce has thickened. To serve, smear a spoonful of ricotta into each crepe and either roll it up or fold it into quarters. Top with a drizzle of the blueberry sauce.